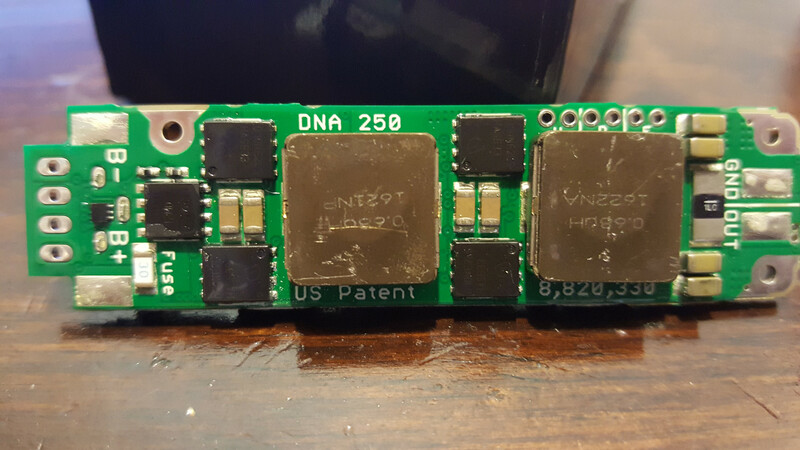 Evolv, Inc > Categories > General Discussion > DNA250 board. Really a 200. So I just got a replacement 200 from Evolv and the board itself is a 250. When hooked up to Escribe it reads as a 200. Has anyone seen this yet? Wondering if the did away with the old board seeing that the 250 is a bit more robust. Are you sure you received a 250 from Evolv & not a 200? It was a 200 warranty replacement. The board itself has DNA 250 written on it and the fuse is the new style and everything. When hooked up to Escribe though, it comes up as a 200. I wondering if they are just using one board now for both. Did you double check that with 'Get Information' on the General tab? I did yes. It's definitely a 200. I'm not upset because that's what was warrantied. Just wanted to see if anyone else has seen this. I was actually kind of hopeful it in fact was a 250. @Smeef Can you check if your board can do 2A charging? On the device when you increase the wattage does it stop at 200 watts on the display and in Device Monitor? Still limited to 1A charging Wayneo and no Retird, it will stop at 200/133. Sounds like a 200 to me unless the wattage is set in EScribe to a maximum of 200 when it could got to 250 if it is a 250 board. You might try to set the maximum to 250 in the Kanthal Power Limit field in the Mod Tab. If it won't accept 250 then it is a 200 board. I already know that it's a 200. Tried everything in the possibility is was a 250. @Smeef, I forgot to mention, just in case you didn't realize it. To test for 2A charging, you must use, say a half charged battery, and an external charger. On the mod one of the fields must be set to show charging current. Yes I tried it that way. Still limited to 1A. I think they are just using the 250 board for the 200 firmware to gain the better fuse maybe. I'm sure it's easier as well to have one universal setup for both versions. Possibly but it's laid out just like a 250 is.